Practicing yoga while seated in a chair is perfect for the absolute beginner or anyone who might find standing postures or floor-based postures uncomfortable. Yoga on a Chair contains two easy-to-follow thirty-two-minute yoga classes. Both classes include a different series of simple and effective yoga postures that have been carefully adapted to be performed while seated in a chair. These classes will relax both the body and mind, improve movement and mobility, and help reduce stress and tension. Eye Yoga contains two twenty-five-minute classes that are suitable for all listeners. The classes are made up of simple yogic eye exercises combined with gentle rhythmic breathing techniques designed to be followed while sitting comfortably. The classes will relax, refresh, and strengthen the eyes and the surrounding muscles. 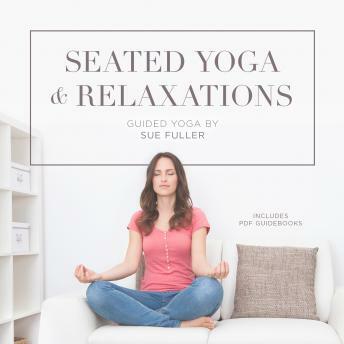 Seated Relaxations consists of two guided relaxation sessions to help relax both the body and mind, reduce stress and tension, and enhance physical well-being, leaving you feeling relaxed and recharged. Inflight Yoga is a must-have session for anyone traveling by air. The class is followed while in your seat and includes simple yoga techniques that will increase circulation and gently stretch the body, ensuring that you arrive at your destination feeling relaxed, refreshed, and recharged.